1Department of Obstetrics and Gynecology, Ghaem Hospital, Mashhad University of Medical Sciences, Mashhad, Iran. 2Department of Pathology, Ghaem Hospital, Mashhad University of Medical Sciences, Mashhad, Iran. *Address correspondence and reprints request to: Mansoureh Mottaghi, Consultant, Department of Obstetrics and Gynecology, Ghaem Hospital, Mashhad University of Medical Sciences, Mashhad, Iran. Yousefi Z, Hoshyar AH, Kadkhodayan S, Hasanzade M, Kalantari MR, Mottaghi M. Neoadjuvant Chemotherapy and Radical Surgery in Locally Advanced Cervical Cancer During Pregnancy: Case Report and Review of Literature. Oman Med J 2013 Jan; 28(1):60-62. For pregnant patients with cervical cancer, treatment recommendations are individualized and dependent on the stage of the disease, gestational age at the time of diagnosis, and the patient's desire as to the cosntinuation of the pregnancy. The aim of this study is to describe the outcome of neoadjuvant chemotherapy with radical surgery and pelvic lymphadenectomy in a woman with cervical cancer who wished to maintain her pregnancy. This is a report of a 26-week pregnant woman with locally advanced cervical cancer stage Ib2 (FIGO) who was successfully treated with neoadjuvant chemotherapy Paclitaxel plus platinum, followed by C/S and radical surgery. Her neonate was healthy and had no abnormalities. This case was the first cervical cancer during pregnancy that was treated using this method at the tumor clinic, Mashhad University of Medical Sciences, Iran. Neoadjuvant chemotherapy is an effort to allow time for the fetal to reach viability by preventing the progression of the disease. Keywords: Locally advanced cervical cancer; Neoadjuvant chemotherapy; Pregnancy; Radical surgery. The incidence of cancer during pregnancy is unclear, but is estimated to be around 1 in 10,000 individuals. After breast and hematological cancers, cervical cancer is one of the most commonly encountered malignancies during pregnancy.1 After the diagnosis of cancer during pregnancy, a multidisciplinary decision with a focus on the medical and psychological aspects and fetal viability is needed. Therapeutic management of cancer in pregnancy is a critically difficult choice, especially because the fate of the unborn child is being decided on. Gestational age of the pregnancy is a critical issue. Avoiding unnecessary delay that causes risk to the unborn fetus is considered an optimal therapy. Each case is unique and the therapy must be carefully individualized. The diagnosis of invasive cervical cancer during the third trimester of pregnancy may become a valuable option with an effort to allow time to reach fetal viability by preventing progression of the disease, by keeping the fact that a modest delay of therapy has not been shown to impact negatively on maternal and fetal survival in mind.2 Fetal evaluation should be managed after 28 weeks with a serial obstetrical ultrasonography, and nonstress testing, biophysical profile testing, as well as umbilical artery Doppler evaluation.3 If the patient desires to postpone the therapy to optimize fetal outcome, neoadjuvant chemotherapy (NACT) may then be considered. The aim of this report is to review this subject and highlight the merits of using neoadjuvant chemotherapy. We report our first NACT case of a pregnant patient with locally advanced cervical carcinoma; the disease was classified as FIGO Stage Ib2 which was successfully treated with neoadjuvant chemotherapy, followed by radical surgery. A 37 year-old woman gravid- 4, Para- 3, with a history of vaginal bleeding before her pregnancy, referred to the division of tumor clinic of gynecological oncology at Mashhad University of Medical sciences at 26 weeks of gestation. She had no history of medical or surgical diseases; all of her three deliveries were vaginal, and she had not taken a pap test during the past ten years. In pelvic examination, we noted a large friable polypoid lesion protruding from the cervix. The tumor was approximately 5 cm in diameter, and there was no involvement of the parametrial tissues. Biopsy of the lesion was proved as squamous carcinoma of the cervix (Fig. 1). This diagnosis of cervical cancer as FIGO stage Ib2 led us to decide to perform surgery regardless of the fetus. This decision was due to the unsuitability of our NICU for the presence of a preterm baby, and permission for 8 more weeks until gestational reached at least 34 weeks was a risk to be taken, but sessions, she accepted to undergo NACT and permit gestational advancement. She subsequently received chemotherapy with paclitaxel 60 mg/m2 and Cisplatin 80 mg/m2. The treatment cycle was repeated after 10 days, a total of 4 cycles. The patient had no significant hematological, renal or liver toxicity, she only suffered from nausea and vomiting. The fetus was followed with serial ultrasonography and did not demonstrate intrauterine growth restriction. Evaluation of tumor response during neoadjuvant chemotherapy was through vaginal examination by three expert gynecologist oncologists who found tumor regression. The patient was advised to undergo definitive treatment immediately after she received final chemotherapy. We decided to perform elective cesarean hysterectomy three weeks after the final chemotherapy. One week after 4 cycles of NACT, when the lab test was not suitable for major surgery, her active labor was begun and obligatory emerging classic cesarean section was performed because of the invasive cervical cancer. She gave birth to a 32-33 week baby boy; the newborn was 2800 g; 40 cm; its Apgar scores 8/10 and without any minor or major anomaly. After two weeks, she underwent radical type three hysterectomy accompanied with pelvic and Para eortic lymphadenectomy and both ovarian transpositions. Figure 1: invasive large cell non keratinizing scc.The figure show sheat of neoplastic squmous cells with cytonuclear atypia and pleomorphis without keratinization (H&E staining,×100). 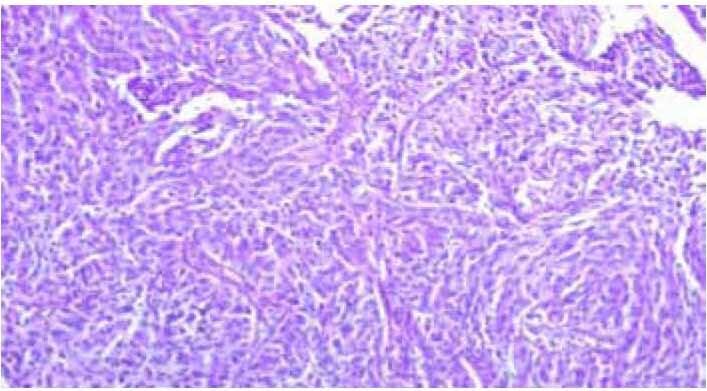 Pathologic report showed micro invasive carcinoma without any cancer in other tissues (Fig. 2), so we encountered a very good response by using the NACT method. Because the stage was Ib2 and she was our first NACT case of pregnancy with locally advanced cervical carcinoma, further adjuvant radiotherapy was proposed. Pediatric follow-up of the newborn showed no signs of any metabolic or hematologic abnormality. In the last follow-up (6 months post-surgery), both the mother and infant were in generally good condition. 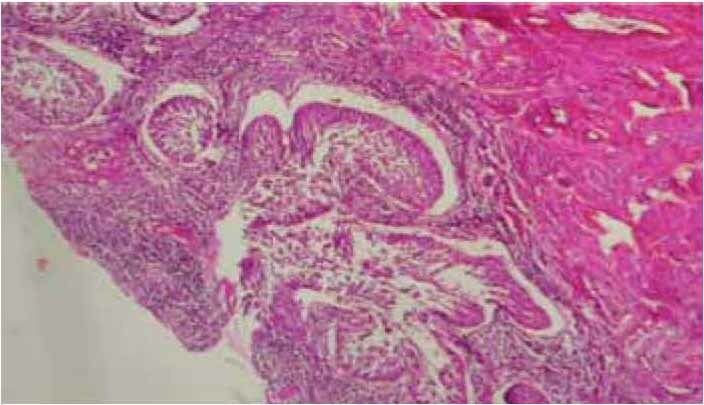 Figure 2: Low power view of micro invasive squmous cell carcinoma of cervix. The figure reveals nests of S.C.C with clefts-like retraction space (H&E staining, ×40). This therapeutic option should be considered in selected women with locally advanced cervical carcinoma who do not want to terminate their pregnancy. 1. Chun KC, Kim DY, Kim JH, Kim YM, Kim YT, Nam JH. Neoadjuvant chemotherapy with paclitaxel plus platinum followed by radical surgery in early cervical cancer during pregnancy: three case reports. Jpn J Clin Oncol 2010 Jul;40(7):694-698. 2. Palaia I, Pernice M, Graziano M, Bellati F, Panici PB. Neoadjuvant chemotherapy plus radical surgery in locally advanced cervical cancer during pregnancy: a case report. Am J Obstet Gynecol 2007 Oct;197(4):e5-e6. 3. da Fonseca AJ, Dalla-Benetta AC, Ferreira LP, Martins CR, Lins CD. [Neoadjuvant chemotherapy followed by radical surgery in pregnant patient with invasive cervical cancer: case report and literature review]. Rev Bras Ginecol Obstet 2011 Jan;33(1):43-48. 4. Boyd A, Cowie V, Gourley C. The use of cisplatin to treat advanced-stage cervical cancer during pregnancy allows fetal development and prevents cancer progression: report of a case and review of the literature. Int J Gynecol Cancer 2009 Feb;19(2):273-276. 5. Duggan B, Muderspach LI, Roman LD, Curtin JP, d’Ablaing G III, Morrow CP. Cervical cancer in pregnancy: reporting on planned delay in therapy. Obstet Gynecol 1993 Oct;82(4 Pt 1):598-602. 6. Gottschalk E, Mangler M, Schneider A, Koehler C, Lanowska M. Pregnancy after lymphadenectomy and neoadjuvant chemotherapy followed by radical vaginal trachelectomy in FIGO stage IB1 cervical cancer. Fertil Steril 2011 Jun;95(7):e5-e7. 7. Li J, Wang LJ, Zhang BZ, Peng YP, Lin ZQ. Neoadjuvant chemotherapy with paclitaxel plus platinum for invasive cervical cancer in pregnancy: two case report and literature review. Arch Gynecol Obstet 2011 Sep;284(3):779-783. 8. Marchiole P, Tigaud JD, Costantini S, Mammoliti S, Buenerd A, Moran E, et al. Neoadjuvant chemotherapy and vaginal radical trachelectomy for fertility-sparing treatment in women affected by cervical cancer (FIGO stage IB-IIA1). Gynecol Oncol 2011 Sep;122(3):484-490. 9. Rabaiotti E, Sigismondi C, Montoli S, Mangili G, Candiani M, Viganò R. Management of locally advanced cervical cancer in pregnancy: a case report. Tumori 2010 Jul-Aug;96(4):623-626. 10. Islam S, Mukhopadhyay L, Howells R. Neo-adjuvant chemotherapy and radical surgery for stage 1B cervical cancer in pregnancy. J Obstet Gynaecol 2012 Feb;32(2):191-192.